If you are expecting a little bundle of joy or have a new arrival you won't want them to be forgotten this Christmas. Piccolo Bambino have a beautiful variety of products that are ideal gifts for babies and children! 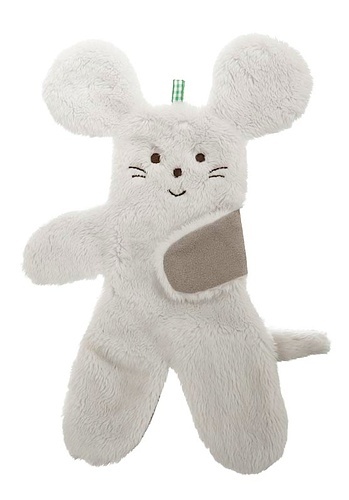 The Borderline Mouse is a stunning comforter for babies with a plush front and sueded back. It's soft and gentle for delicate skin to play with and snuggle up to. Suitable from birth the comforter features contrasting textures to stimulate your child's senses. We have one to giveaway! Piccolo Bambino have kindly provided a beautiful comforter to giveaway. You can enter to win using the Rafflecopter entry form below before 20th December 2012. My youngest daughter have a furry toy giraffe that we got from Edinburgh Zoo when she was a baby! We have been back since and he is obsessed with giaffes! She calls it Jiffy! I'm currently 7 months pregnant so no favourite toy as yet. Friends and family have already bought some cute gifts for the wee one, my favourite is a soft elephant. Favourite is a giant teddy called Dean! Neither of mine really have a special comfort toy. I think I serve that purpose for them. I wonder if Little Miss may take to something as she gets a bit bigger as she hangs onto clothes when she is held at the moment. Time will tell. my 6mth old doesnt have one yet but my 5 year old still loves his mouse teddy bear! i've subscribed to piccolo bambino newsletter as talcfour@hotmail.co.uk via the comments page as the subscribe button wasnt working. I subscribe to the blog using the same address. My little girl has a Mickey Mouse first Christmas blankey which she loves. Think it's because it's such a bright colour and so soft. I have signed up for the newsletter and blog, lovely comforter! This would be perfect for my sister bump (baby boy to be) I'm sure he would love it!